PHOENIX — For about seven months, Arizona Rattlers Head Coach/General Manager Kevin Guy has owned the Tucson Sugar Skulls. On Saturday night, Guy and his Rattlers owned Tucson on the scoreboard. 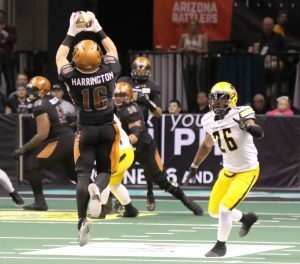 Fueled by five touchdowns from quarterback Verlon Reed Jr. and a 28-0 scoring surge, the Arizona Rattlers continued their early-season dominance Saturday with an easy 63-28 victory over the expansion Tucson Sugar Skulls at Talking Stick Resort Arena. Guy admitted his team didn’t practice well leading up to Saturday’s game that followed the Rattlers’ first bye last weekend. It showed early as Arizona fell behind 7-0 as Tucson’s Mike Jones scored a 2-yard rushing touchdown. “We just needed to settle down a bit,” Guy said. In two previous victories, Guy has played both quarterbacks — Reed and Jeff Ziemba. 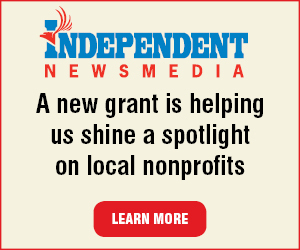 Against Tucson, Reed got the start and paid quick dividends with a 26-yard touchdown strike to Dezmon Epps who returned to Arizona after a short stint with the Washington Valor of the Arena Football League. Epps caught the pass along the side boards, broke a pair of tackles and danced into the end zone. Jimmy Camacho hit the extra point to tie the game at 7-7. Arizona’s defense then forced a fourth down and Tucson kicker Diego Marquez tried a long field goal. It never had a chance as Rattlers’ defensive lineman Nikolaus D’Avanzo stormed through the Skulls’ line and easily blocked the attempt. The bouncing ball fell into the arms of Dillon Winfrey who tumbled into the end zone for a huge special teams score as a raucous announced crowd of 16,110 went wild. The Camacho PAT made it 14-7. The Rattlers (3-0) kept the momentum going on the next Tucson offensive series. Skulls QB Matt Behrendt scrambled upfield but was met rudely by Arizona’s Davontae Merriweather, who forced a fumble that was recovered by Lance McDowdell. Shortly after, Reed darted in from three yards and the Rattlers had a two-score lead. Behrendt recovered from the hit to get Tucson (2-1) back on the board. He scrambled for a 16-yard touchdown but Reed responded with a 13-yard touchdown pass on a bullet to Markis Sumpter. Marquez missed another field goal from 38 yards away and the Rattlers were back in business with about a minute before halftime. Running back Jabre Lolley showed again he is a legitimate threat catching the football, nabbing a 29-yard strike from Reed to give the Rattlers a 35-14 halftime lead. Reed tallied his fifth score of the night about five minutes into the second half, a 7-yard run that extended the lead to 42-14. Jake Medlock replaced Behrendt at quarterback for Tucson but had little luck. Marquez missed a 57-yard field goal on the next series. Ziemba entered for Reed and there was no dropoff. He led the Rattlers down the field quickly and called his own number for a 7-yard rushing score. Jones then scored his second TD of the game for the Sugar Skulls but they still trailed 49-21. Up by 28, it was Lolley time — Arizona’s bruising running back was punishing Tucson’s defense with every carry. He scored from 25 yards out then following a fumbled Skulls kickoff return, Lolley cashed in again from 3 yards away. 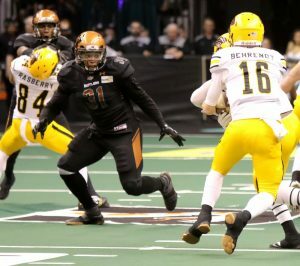 Camacho made the extra point to cap off a 9-for-9 day and the Rattlers led 63-21. Medlock threw a late TD pass but by that time Rattler Nation was already celebrating another big home win. In three wins this season, the Rattlers have scored 195 points while the defense has given up just 86. The new in-state rivalry was billed as the first game ever between two pro football teams both based in Arizona. During postgame, Guy downplayed the fact he was coaching against a team he owns. Reed was efficient, going 7-for-12 through the air for 121 yards, 3 TDs and no INTs. He added 33 more yards on the ground and two more TDs. Lolley added 61 rushing yards and two scores on the ground while Ziemba also had a rushing TD. The offense averaged 7.1 yards per play. Defensively, D’Avanzo and Chris McAllister each had one sack. Tucson was led by Jones’ two rushing scores. Arizona has its second bye of the young season next week. Guy said his job is to keep his Rattlers team focused after they return to practice. Arizona next plays on March 31 — a 3:05 p.m. kickoff against the Sioux Falls Storm.